This sophisticated balsamic vinegar will encourage you to experiment more in the kitchen. 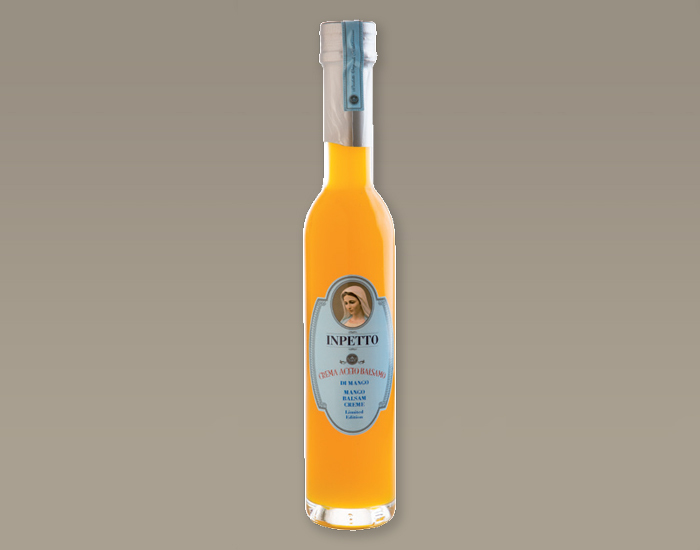 It’s perfect for any dish that needs a slightly fruity, slightly acidic note, such as salad dressings or any kind of cheese, particularly cream cheese. Try a new aperitivo – a teaspoon of Aceto balsamo di lampone in a glass of prosecco or sparkling wine, and it’s summertime once more! 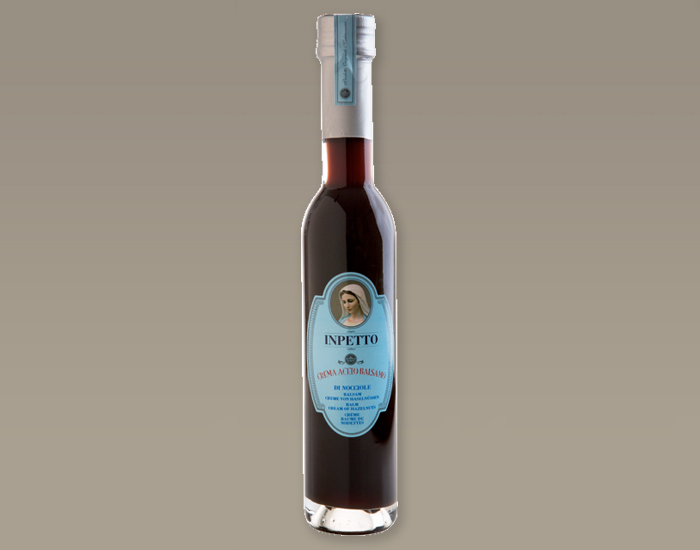 A perfectly blended balsamic vinegar – fruity & sweet, with a hint of acidity. 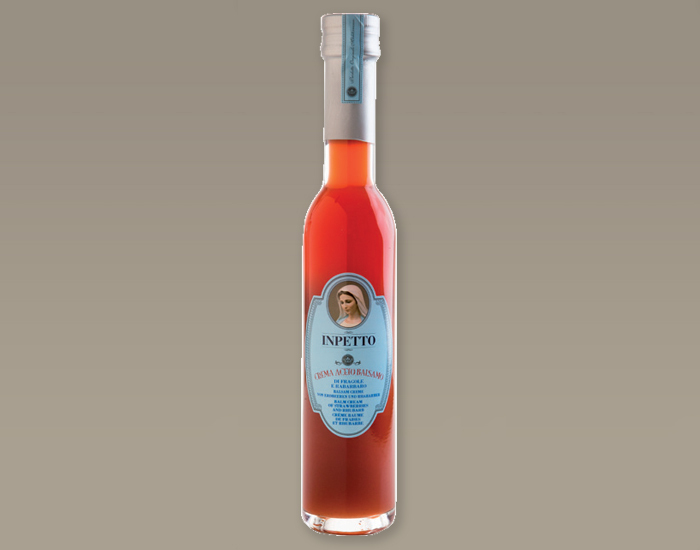 How about serving up spinach alongside lobster or a salmon fillet, with a dressing made from INPETTO aceto balsamo di albicocca, INPETTO Olio di oliva extra with a teaspoon of INPETTO Mostarda di buongustai. 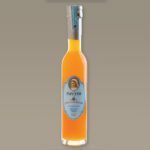 Perfect for those who love exotic flavours. 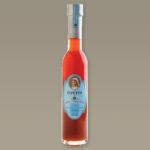 Our balsamic vinegar is made only using the ripest, most aromatic fruit. 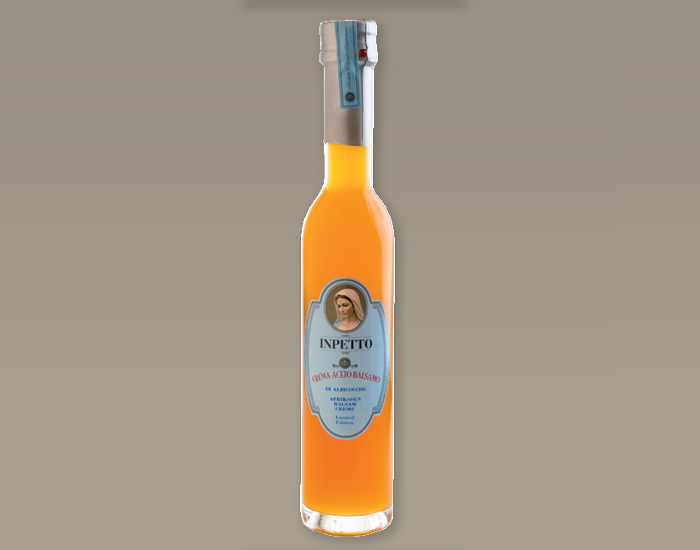 It’s sweet & fruity, with a rich, delectable mango flavour. 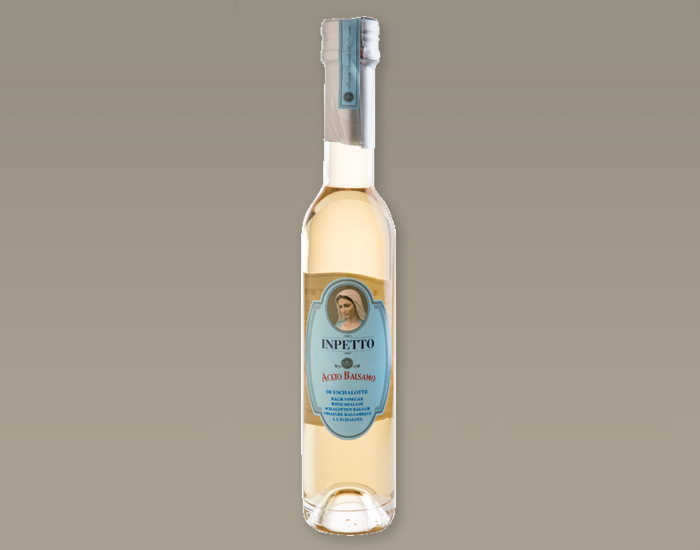 How about using it to make an aperitivo? 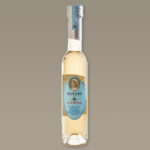 Add 1 teaspoon to a glass of dry prosecco or sparkling wine. 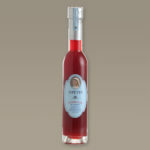 Pair it with any dish that needs a sweet, fruity note. Fig-infused balsamic vinegar. 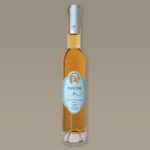 This works wonderfully with cheese or desserts containing cheese. For each portion, poach half a pear in a fine sieve over bubbling, boiling water. Arrange on the plate. Using a mini parmesan grater, grate flakes of Parmigiano-Reggiano onto the pear. Melt the parmesan on top of the pear under the grill. Then, drizzle some fig-infused balsamic vinegar over it and serve. Buon appetito! 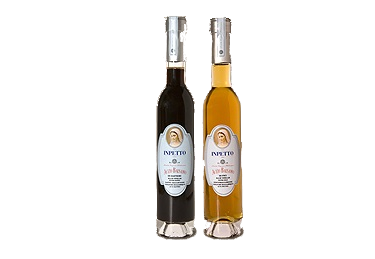 Anyone who has tried or tasted Aceto balsamico di Modena loves how versatile it is. Working in close cooperation with a small manufacturing company, we have managed to create a new product which adds a pleasant flavour to many dishes. Our balsamic vinegar is infused with delicious dates. Cut the scallops diagonally into 12mm slices. Cut the leek into fine, Julienne strips, sauté them in a little butter, lightly salt them, and arrange them in the shape of a nest on a hot plate. Sear the scallop slices in a pan with a little INPETTO olive oil for 1 minute on both sides. After turning them, salt them, remove them from the pan and use them to garnish the bed of leeks. Drizzle the date-infused balsamic vinegar across the dish and serve. We also recommend making a warm lentil salad with date-infused balsamic vinegar and gambas, flavoured using INPETTO Aceto Balsamo di Fici. The mellow flavour of Williams’ bon chrétien pears, combined with the light acidity of white Balsamico Crema with precisely 5% alcohol, gives poultry and game dishes an extra kick. 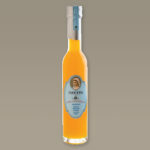 It is also perfect for salad dressings, desserts and cheese. lightly pan-fried goat’s cheese doused with a little Aceto balsamo bianco della pera, on a bed of fresh leaf salad or lamb’s lettuce, mixed with a fine dressing made from INPETTO Olio die Oliva Arbequina, INPETTO Aceto balsamo bianco della pera and a spoon of INPETTO Mostarda graneloso culminante. Arrange on a plate and serve. This delicately sweet, lightly acidic, yet slightly fruity balsamic vinegar is perfect for dishes that need a mildly sweet, mildly sharp note. It should be added to meat sauces and salad dressings.Or how about pairing it with fish or hard cheese? Cut the calf’s liver into strips and roll in flour. 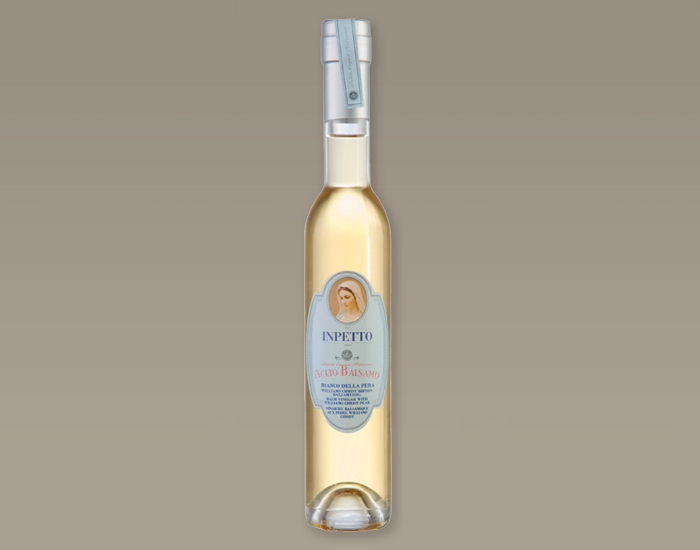 Briefly and quickly fry it with a few onion rings in INPETTO Olio di oliva. 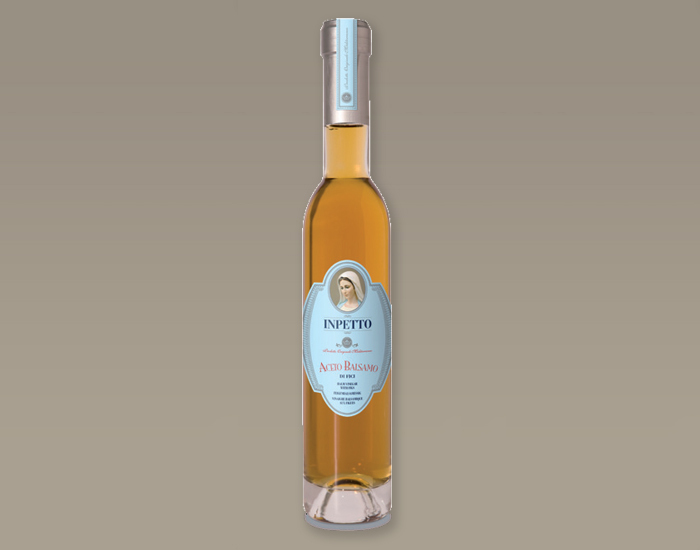 Douse with INPETTO Aceto balsamo di mirtillo rossi. Serve immediately with potato purée or polenta. Nocciola Piemonte, or hazelnuts from Piedmont, are considered the best hazelnuts in the world. After harvesting and a week of drying in the sun, the cracked hazelnuts are carefully roasted in small amounts at 150 degrees. Processing the nuts in this way intensifies their characteristic flavour and makes them good enough to use in our delectable INPETTO Aceto balsamo di nocciole. It’s all that you need for dishes that need an acidic kick paired with a nutty flavour. We recommend using it in game dishes or in a dressing for oak leaf lettuce. But you can also pair it with gorgonzola or other blue cheeses for a particularly refined gourmet experience. sprinkle the cubed mozzarella over the spears (the mozzarella will melt finely on the asparagus). Drizzle the pre-made dressing over the asparagus and serve. This fruity balsamic vinegar can also be added to dry sparkling wine, prosecco, crémant and champagne. Create a drink that will refresh your taste buds in the springtime.